Throughout the year, teachers are hard at work preparing lesson plans and improving their skills. And after school, on the weekends and during breaks, they also invest time in professional development, to expand their knowledge base and learn from their peers. We asked three school districts to share their best practices and programs to help teachers sharpen their skills and advance their careers. These programs can serve as inspiration for training programs throughout the school year. Okeechobee County School District’s professional development program, Camp IT, is democratic: for teachers, by teachers. 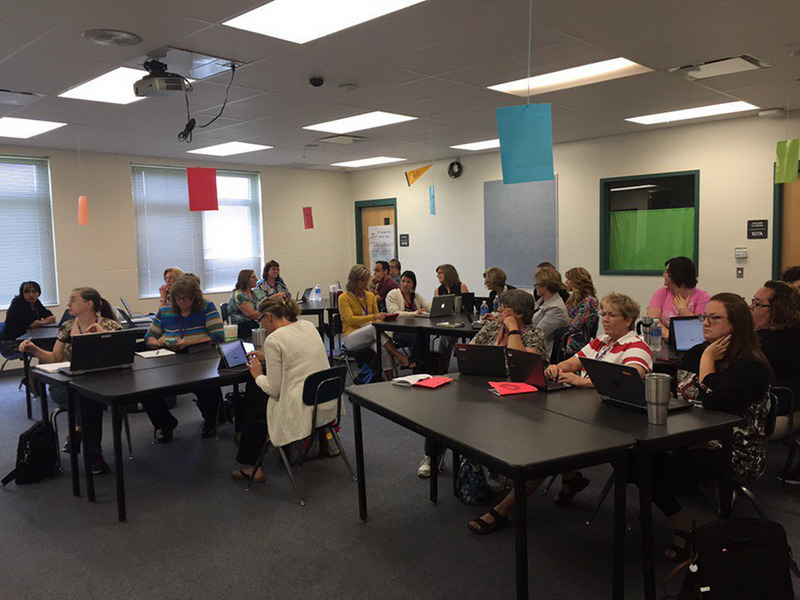 At the two-day summer training camp, teachers brainstorm topics, such as how to use Schoology or Google for Education to engage students, and the 12 most popular topics, chosen by a vote, are explored throughout the day. This loose structure, which is often referred to as “unconference,” allows for personalized learning and more informal and interactive peer discussions. “The more teachers can take charge of their learning, the more voice they will have because they’ll be learning what they’re passionate about,” says Michelle Branham, coordinator of instructional technology. Teachers at Camp IT talk in small groups about how they use technology in the classroom. Camp IT’s informal and intimate setting encourages more teachers to lead and contribute to sessions. With groups of five to 10 people, teachers feel more comfortable sharing their expertise and advice than they would with a large room of people. 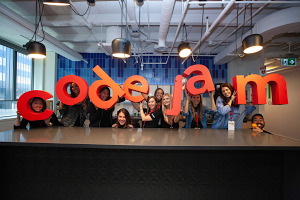 “When the program began six years ago, vendors led a lot of the sessions at Camp IT, but we’ve shifted to a teacher-led program because teachers take more away from peers who are teaching them than a vendor who hasn’t used the tool in the classroom,” says Shawna May, director of information technology. 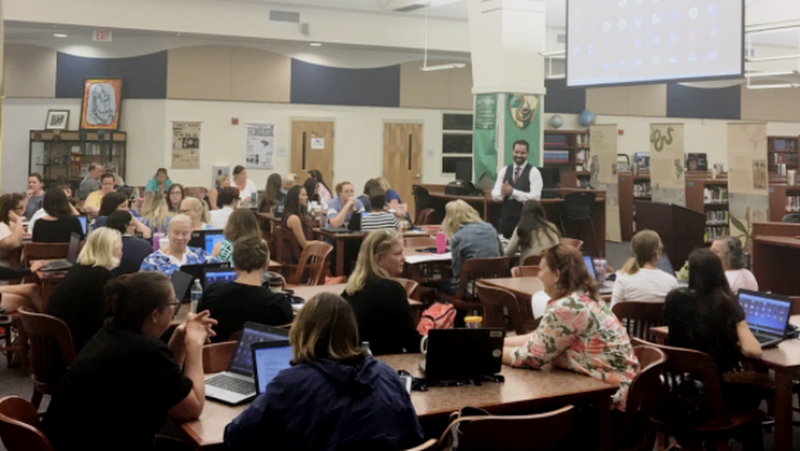 Seminole County Public Schools holds a two-week summer institute for teachers and administrators called “The Power of You.” The sessions focus on core subjects, like math and English, as well as the curriculum. If the school is rolling out new learning software, they’ll also host a session around how to use the tool in the classroom. Teachers choose specific topics depending on what’s most useful to them, such as “How to Teach Visual Learners” or “How to Provide Valuable Feedback via Google Docs,” and have the flexibility to attend one day or the full two weeks. They also get a stipend to attend, and qualify for an additional stipend if they submit a reflection paper at the end of their professional development. For example, a teacher can turn in a sample lesson plan after learning about a new learning management system and receive the reflection stipend. “We believe strongly in reflection on implementation and practice,” says Beth Pocius, the district’s manager of blended and digital curriculum implementation support. Martin County School District in Florida hosts a four-day program similar to Okeechobee’s Camp IT called CampTEACH. The program empowers teachers to lead sessions and share their skills, and gives them the chance to network with others in the district that they might not see during the school week. 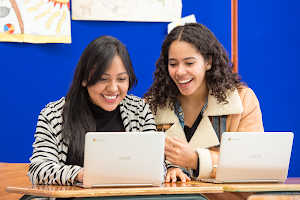 “CampTEACH focuses on effective use of technology in the classroom and serves as a forum to highlight great strategies and techniques teachers are using and gives them the opportunity to share those with their peers,” says Douglas Konopelko, Coordinator of Digital Learning, a Level 2 Google Certified Educator and Certified Google Apps Administrator. Douglas Konopelko leads teachers through a brief tour of Martin County School District’s digital resources. Camp IT and CampTEACH differ in that Martin County invites educational partners, such as Promethean, Safari Montage and HMH, to lead sessions. This allows for enormous variety—the 2015 summer program featured 83 sessions—but the most-attended sessions are still those taught by teachers, who can share on-the-ground experiences and relate to their peers’ daily struggles. “Teachers’ faces lit up when they realized the power of these collaboration tools,” Falco adds. "Through these trainings, teachers are now able to use Google tools that allow for students to create authentic products, work in real-time collaboration with their peers in one document and experience what Google really has to offer for the classroom environment." These districts are just a few that are personalizing professional development for their teachers’ needs. We’re always looking for new sources of inspiration—share how your district provides teacher training opportunities by tagging @GoogleforEdu on Twitter.